Considering the visits that we’ve been getting from across the web, it’s very obvious that people are itching to get their boats out on the water. 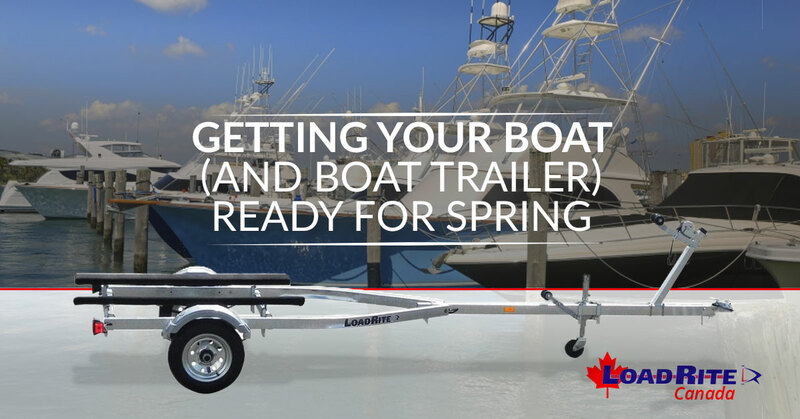 While we’ve gone over tips for checking your boat trailer once winter is over, today we’re going to take a look at some tips on how to get your boat ready for spring. No, it’s not spring yet, but when you inspect your boat in late winter, you’ll have more time to get repairs made before it’s time to put it out on the water. Here’s something that can help both your boat and the boat trailer if you store it outside over the winter: check the tarp. That might sound strange at first. What does the tarp have to do with the integrity of the boat or its trailer? Well, a torn tarp can signal you to a damaged part of the boat. If the tarp is torn, look directly under the tear. Did a bunch of snowmelt get in there and keep a part of your boat wet all season? Did the freeze-thaw cycle get into cracks in the boat and force some seams apart? How about your boat trailer — did the handle on the crank tear a hole in the tarp and let the weather in? Think of a torn spot tarp as a flashing arrow regarding what part of the boat or trailer to double check. You shouldn’t just pull off the tarp and assume your boat is ready to go. Conditions can still change during the winter, even if the boat was completely stationary. Expanding and contracting panels can cause screws to become loose, and if your boat is aging it’s also possible that cracks developed in the hull over the winter. Check it from the inside and the outside, top to bottom. Some problems will be cosmetic, some minor, and some could be catastrophic. If you don’t have the skills to fix the problems yourself, you’ll at least have a couple months before you put it on the water to get it taken care of. Before you get your boat on the water, you’ll want to make sure that everything is in order. Be sure your registration is still valid, and that your boat identification numbers didn’t drop off during winter. At the same time, check that your safety gear — fire extinguishers, flares, life vests — are in place and haven’t expired or gotten damaged during the off season. Get Your Boat and Boat Trailer Ready! If you pull the tarp off your boat for the first time at the beginning of May, you might be greeted by some problems that you wished you took care of in February. Take care of them now and you’ll be able to drop your boat in the water on the first warm day. Make sure you’re ahead of the game with your small and large boat trailers as well. Find the hours for our Monkland or Innisfil yards right here!